Blackpool Tower now has to fight for attention with a wordy groundscraper sprawled at its feet. 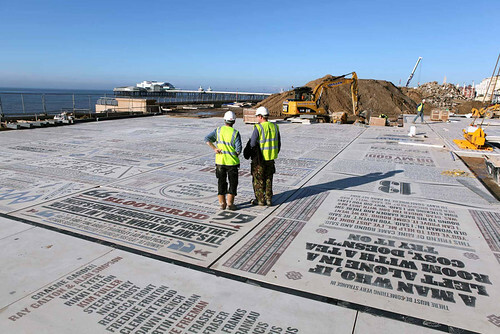 The Comedy Carpet, created by artist Gordon Young in collaboration with Why Not Associates, is a celebration of comedy on a vast scale, with lines and jokes from some of Britain’s best-loved comedians and performers hewn in concrete and granite across Blackpool’s seafront. 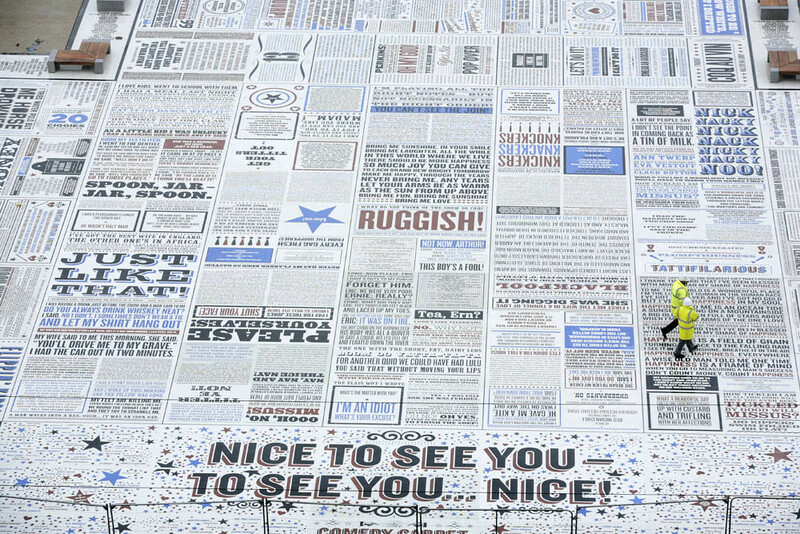 The 2200m² work contains more than 160,000 granite letters embedded into concrete, and refers to 1000+ comedy writers and performers. Part of a wider regeneration of Blackpool's promenade, the Comedy Carpet is arranged in a cross shape, linking the entrance of the tower to the beach and connecting the north and south sides of the promenade. 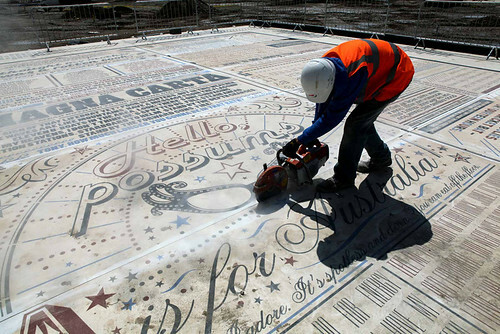 The work can be read in different directions, from close up and from the top of the tower, with the letters varying in size from a few centimetres to more than a metre. 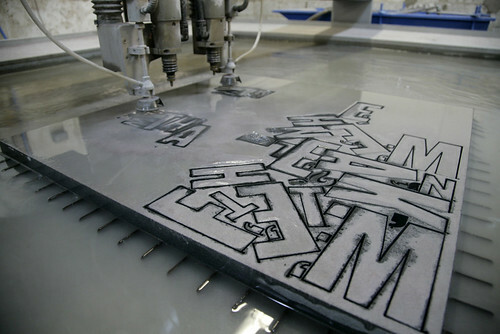 Above and below: The cutting of some of the 160,000+ granite letters that went into the piece. 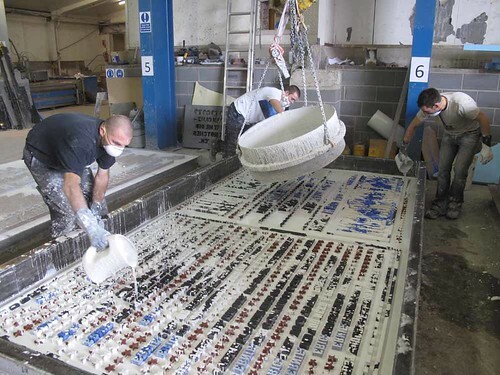 Young (whose collection of ‘Reiver records’ was featured in Eye 55), had to set up his own factory in Hull to produce the artwork, as its scale and complexity proved too much for contractors. 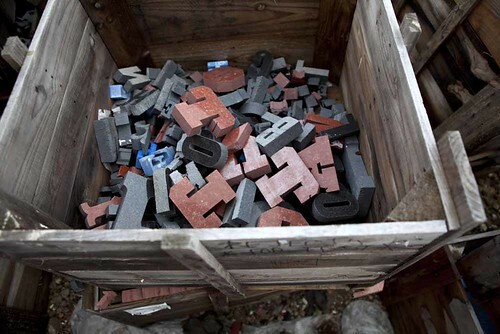 He ‘wanted to create a work with self-consciously high craft standards, as embodied in the town’s historic architecture’ and he felt that a run-of-the-mill paving area would not do. 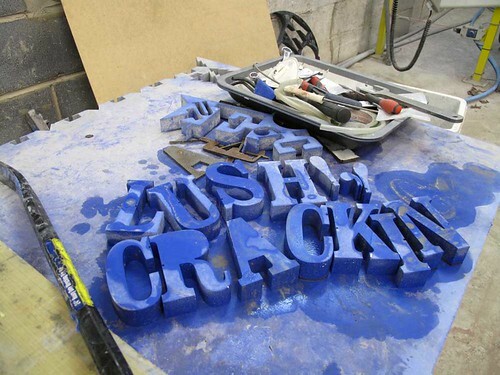 Above and below: The granite letters are typeset and surrounded by poured concrete, before all being polished back to an even surface sheen. 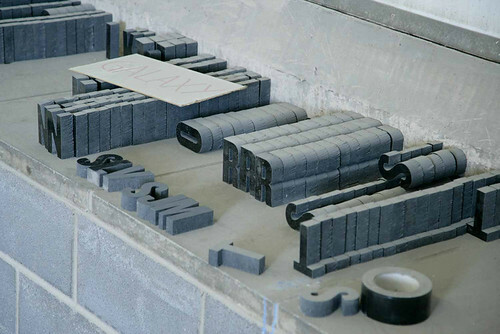 Why Not Associates – long time collaborators with Young – were responsible for the typography. This is not the first time Eye has featured a collaboration between Young and Why Not’s Andy Altmann. Their Flock of Words installation in Morcambe Bay was featured – while still under construction – in ‘A flock of words’ in Eye 45 (Autumn 2002), with additional photographs by Anthony Oliver on the inside covers. The intervening period has been a fertile one for Young and the Why Nots, with a host of other collaborations around the UK, but the Comedy Carpet (also featured in this month’s Creative Review) is the biggest yet. Above and below: Installation of the Carpet on the Blackpool waterfront. 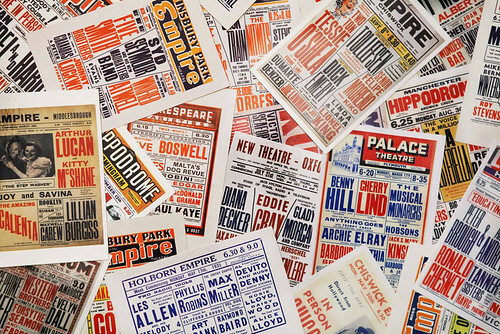 Above: Some of the playbills and flyers that inspired the project. See also WhyNotAssociates.com and GordonYoung.net. Eye is the world’s most beautiful and collectable graphic design journal, published quarterly for professional designers, students and anyone interested in critical, informed writing about graphic design and visual culture. It’s available from all good design bookshops and online at the Eye shop, where you can buy back issues, including Eye 45.